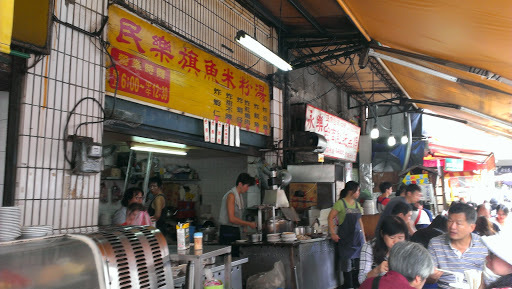 迪化街 DiHua street is a hugely popular area ,especially around Chinese New Year Holiday. However, it remains busy year-round selling all sorts of Chinese herbs, Taiwanese souvenirs and a multitude of different traditional Taiwanese food. As you walk down DiHua street, before reaching the end, the left side of the street opens up and 永樂市場 YongLe market comes into view. We got there around 11am on Sunday, and almost all of the stalls inside the market itself had already closed. I’m not sure if it closes on a Sunday or we just got there too late. But we will go on a Saturday next time, I guess. Rice noodle soup is a great alternative for those times where you are completely fed up of rice and noodles. Even though it’s essentially a mix of both, it has a different texture and flavour. Rice noodles can be varying thicknesses, but these ones are of a medium thickness for rice noodles. Within the soup there is also pieces of tuna and some fried onion. The broth is clean, has a mild fish taste and isn’t too greasy. 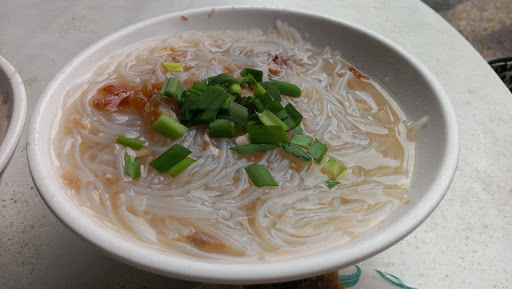 The rice noodles themselves are well cooked: still a slight resistance in the centre of the noodle. When rice noodle soup is done well, its wonderful. When it isn’t, its a sad day. But, don’t worry, this bowl is done very well! I’m a fairly recent convert to Oysters upon arriving in Taiwan. Whenever I see them now, I will give serious thought in whether to order them or not. 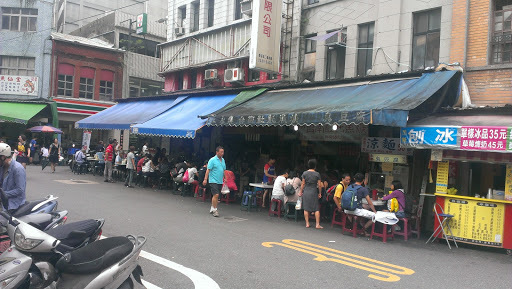 However, prior to coming to Taiwan, I had a bad experience with them so I would completely ignore them on a menu. These oysters are deep fried in a crispy batter. Such is the texture of oyster, that the middle remains silky smooth and soft, whilst the outside has a good crunch to it. The flavour of the oyster is very good indeed: slightly salty, strong fish taste but also a creamy consistency. There is a really good portion of oysters here, and coupled with the mildly sweet sauce and the spicy ginger, it is a triumph. 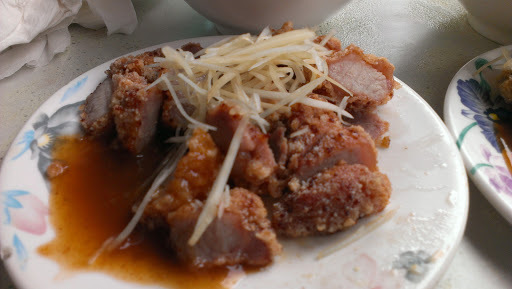 Red braised pork is quite common throughout Taiwan. It originates in China, and uses pork belly. Originally, it was slowly braised so much so that the fat melted, and served atop rice. However, this variation doesn’t use belly, but still uses the original spices. It is lightly fried so it is crispy and the middle remains moist. With noodles or rice, or rice noodle soup, it makes for a good meat accompaniment! As far as prices are concerned, I can only hazard a guess at the individual costing as there are no visible price signs. Overall the meal cost us $140. Therefore, I would think that each bowl of rice noodle soup is around $30, then each other small plate would be $40. It isn’t going to break the bank, that’s for sure! Best dish: 1. 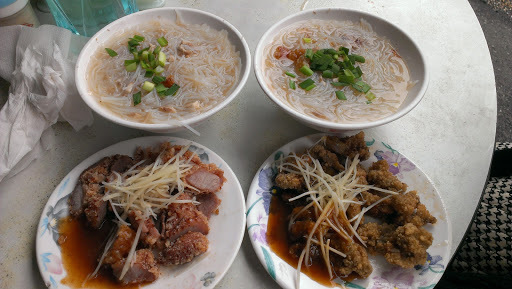 米粉湯 mi3fen3tang1 Rice noodle soup. 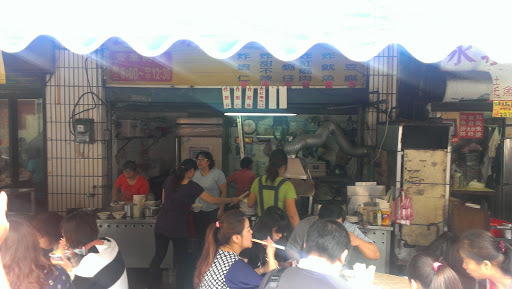 It’s easy to find an average rice noodle soup in Taipei. But to find a good one isn’t so easy, this definitely falls into that category. I would strongly recommend it, if you’re in the area. Dish I wouldn’t order again: None. I would gladly order all of them again, twice over. 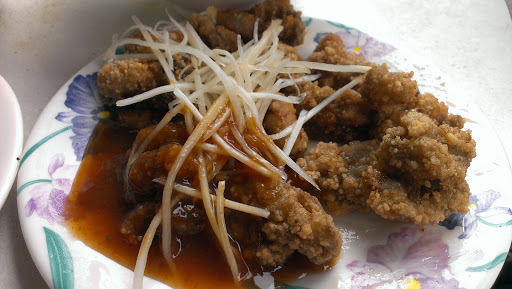 For the English speaking community travelling in Taiwan, I work hard to build my site and fill it with useful information and pictures of food for your viewing pleasure. If you appreciate my posts and want to help me to keep going, I'd very much appreciate any voluntary contribution towards Eating In Taipei. Ash.